As a Christian, springtime holds a plethora of different rights and rituals to adhere to. The most significant (in my opinion) would be Easter. I think that there is a general understanding that Easter is even more important than Christmas. At least in my general group – Easter is when Christ died for our sins and rose again conquering death and saving souls. I find that I love this time of year. Not only because it’s spring, it’s almost my birthday (woohoo! ), but also because of the Easter celebrations. I love that I can see the church at work through the changing of the season. Has anyone else noticed that Good Friday almost always is bad weather? Gloomy, rain, storms even. And then Easter Sunday and Monday are bright, sun shining days? I love that I can see the reflection of my faith in the weather. Growing up, our church (a baptist church) never participated in Shrove Tuesday, Ash Wednesday, or lent. I know quite a few Protestant churches do, but ours didn’t. I’m not exactly sure the reasoning behind it, though. My brother started participating in Lent a few years ago, and I think he finds it very helpful for his faith (even my friend who is agnostic participates in lent!). I’m not as strong in my faith as I would like to be, so I think I will participate in Lent this year to try to refocus myself. Now that I work for a Catholic family, I find that I am being drawn back into my faith a little bit more. I like it. I also really like having deep theological conversations with 2nd. She is a super curious girl and wants realistic answers for things. I don’t have to sugar-coat the truth for her or turn it into kid-friendly words. She gets it. I like that. Lent in 2017 will start on Wednesday, the 1st of March and will continue for 46 days until Saturday, the 15th of April. In Western Christianity Lent begins on Ash Wednesday and concludes on Holy Saturday. The six Sundays in Lent are not counted among the forty days of lent because each Sunday represents a “mini-Easter”, a celebration of Jesus’ victory over sin and death. So that’s pretty much a long time. But does that mean that Sundays are cheat days? I knew it was 40 days, but to start tomorrow and end on my actual birthday? That puts it into perspective a little bit. It’s like a mini-countdown for me. My boss says that for their Roman Catholic Church, it officially starts on Sunday and goes all the way up until Easter. A simple google search says March 1-April 13. So I guess there is a little bit of wiggle room. From my understanding of lent, it’s a 40 day fast (to mirror the 40 days of temptation that Jesus faced in the desert). The hard part for me is to decide what to give up. On Christianity Today, there is a list of Twitter’s top choices. Number 1 is fasting from a specific food or drink. I know a lot of people give up sugar or junk food. My agnostic friend usually gives up meat and sugars. Although her birthday always falls in the middle so she gets a cheat day. 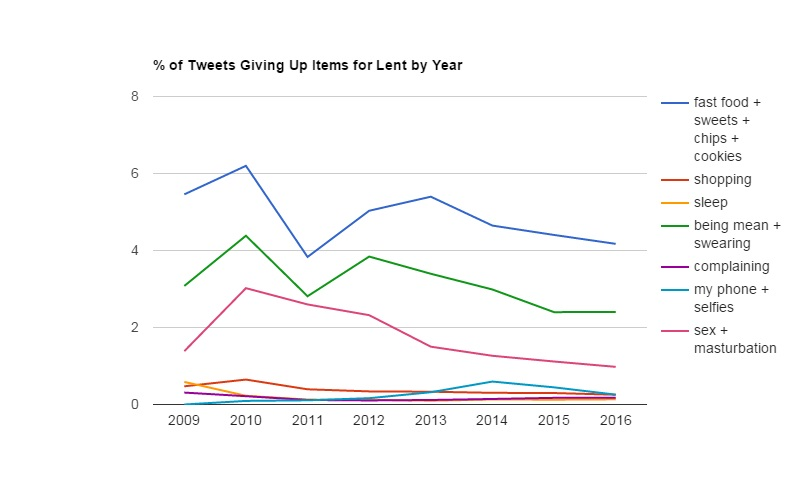 On the same website, one expert has graphed the giving up of the “seven deadly sins” for lent (gluttony, sloth, greed, lust, vanity, pride, envy, wrath). So now I’m in this mini-panic where lent starts tomorrow and kind of need to pick something to give up. I was thinking maybe Facebook, but I’m already trying to give that up. I could give up my nail obsession over the month but that’s really just like two days of not painting my nails over the 6 weeks. Junk food is always a great option as well. I could decide to ADD something to my life instead of taking something away, such as a daily bible study or prayer time, or actually finding a church to go to and start attending services. There is a list of the top 100 tweets on that website as well. Some people have decided to give up lent for lent (really?) Sugar and junk food seem to be a very popular choice. 5 people even tweeted that they would be giving up virginity for lent – now I think that might just be missing the point here? But as someone who has never actually participated, I’m not going to pass judgement (let’s be honest, I’m totally judging those people). Coffee. I can’t give up coffee. I’m not going to go through a month of withdrawals and headaches. I’m sorry – I can’t! I could consider not going to coffee shops but I will not be giving up the drink altogether. Blogging. I could stop blogging but I would go insane. And then what I’ve worked for over the last year and a half would be completely wasted because my blog would be left dormant for 6 weeks. Not happening. No way. No how. My phone. I suggested to The Kidlets that they give up non-homework related screen time. They suggested I give up my phone. I can’t give up my phone since I don’t have a landline. If I did, I might consider it. But they want me to turn my cell phone off for an entire month. That’s impossible, especially since I use it daily for work. So while I spend the rest of the day wondering what I will give up for lent, and if I will start on Wednesday or on Sunday, I wonder what about you folks? Do you participate in lent? Want to share what you are giving up/adding to your life to strengthen your relationship with God (or just for the heck of it like my agnostic friend)? I am not a wholly religious person as of late but I do like the idea of lent. Last year I gave up shopping and it was the hardest thing I had to do. This year I am considering taking one thing out of my house for either donation or garbage. We shall see. Yeah I like the idea of lent as well. If you take the religious connection out of it, its still a good thing. A disconnect from something, breaking bad habits or forming new good ones. Its always a good thing 🙂 i like the donation idea! LOL. I don’t want to give up something. I will add something. Daily meditation, exercise, etc.